What Are The Modern Bathroom Must-Haves? Big windows in the bathroom will always keep the air inside fresh. Rays of light coming into the bathroom will make it look ventilated, airy and refreshing to be in. Plus, having a lot of natural light in a small bathroom will make it bigger. Of course, when the evening comes, make sure you have dim lighting to set up just the right mood for a relaxing bath or a romantic evening. Softer illumination is always a better choice than bright electric light. Backlit mirrors are a nice touch and a couple of candles spread around the room for a special mood. Applying tiles from the floor to the ceiling will add the feeling of luxury to the bathroom. You can opt for large stone tiles in order to create a unique effect that looks like a single element in the room. You can choose between bold patterns, classic white or stone. Having stylish ceramic tiles will be the easiest ones to clean. Of course, you don’t have to apply tiles to the whole bathroom – coveted tiles on the floor only and using a simple pattern on the walls will still look beautiful and won’t cost you much. 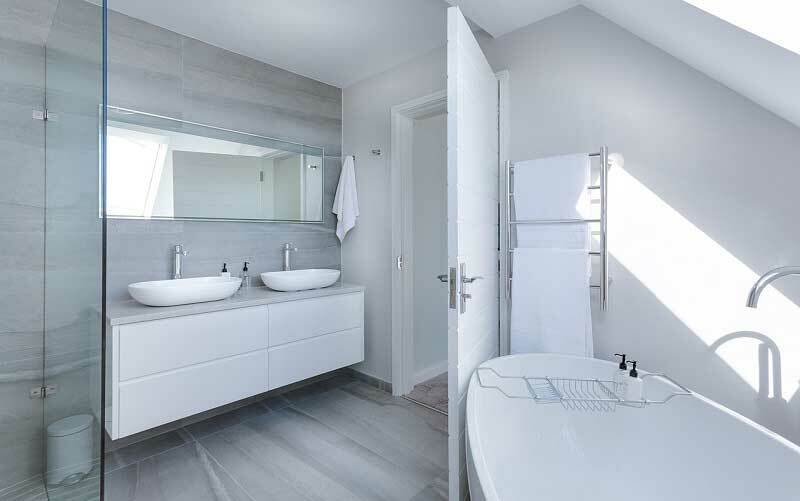 It’s best if you can install a double washbasin – that way, everybody can follow their own morning routine and not disturb the others. Many washbasins come in pairs, so you only have to choose the style and size you need for your bathroom. You can even choose them to be suspended f you need more space in the room or opt for a recessed one, to remind you of tradition. Regarding the materials used, ceramic, stone and marble minerals are the most common ones. There are many misconceptions about bidets. The truth is they really help you with your hygiene and also help to ease the hemorrhoid troubles and improve genital health. Lastly, they reduce the use of toilet paper, which means they are environmentally friendly. You can choose between various bidet types for every budget – you only need to decide which one best suits your needs. Having a walk-in shower is just like having your personal spa feature in the bathroom. You just step into it and done! Plus, the glass door makes the impression of a larger bathroom. Of course, you shouldn’t deprive yourself of a comfortable bath to relax your senses in warm water and a glass of wine. Choose the type you like and add a small stool to put down the book or a glass. Lastly, find a fitting tub tray to keep the essentials close. You won’t enjoy your bath if you feel cold after you get out of the bath, so consider in-floor heating. It can be laid under the tile or under the subfloor. It will contribute to the overall temperature in the bathroom and keep your feet warm – a true feeling of luxury! Another way to use the heating is to have a heated towel rail. Why would you reach for a damp towel? It can be mounted where the old-fashioned radiator used to be. Plus, they really look nice! 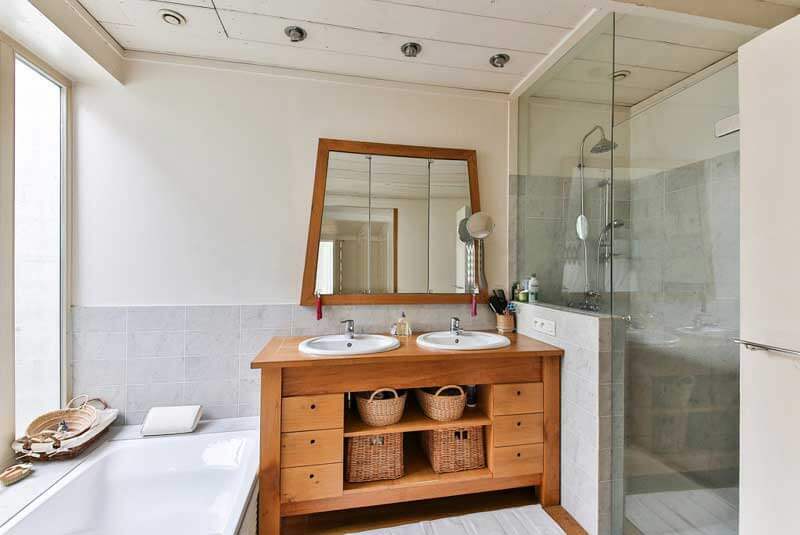 A bathroom would be incomplete with at least one big mirror in it! 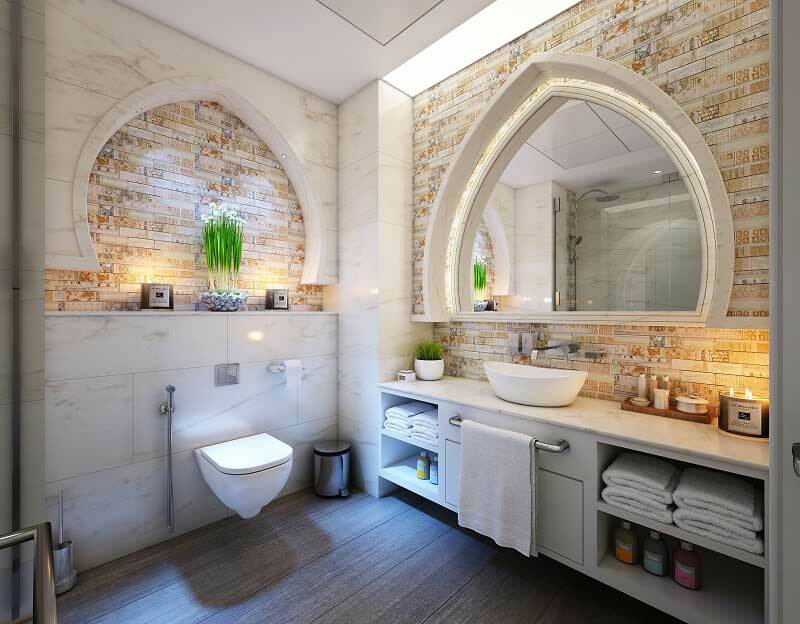 Whatever you do in the bathroom, you will always be checking yourself – your teeth, your hair… Mirrors are usually mounted above the washbasin but you can add one more to reflect the light coming into the bathroom. It will make the space larger and contribute to the relaxing atmosphere. Your bathroom should be your safe haven, free of the hustle. That’s the room where you go to energize yourself and wash away the remains of a stressful day. That’s why you shouldn’t deprive yourself of the features that constitute a modern bathroom. After all, you deserve it!